The Crawford Fund’s 2015 Food Security Journalism award was launched today at a food security focussed event hosted by the Rural Press Club (RPC) of Queensland. 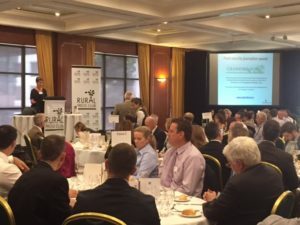 The Fund is joining with the Australian Council of Agricultural Journalists for the third year of the award which has seen a sustained interest from Australian journalists. 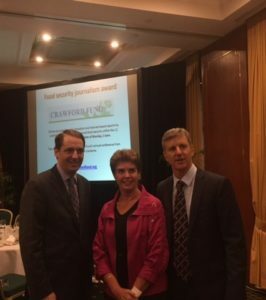 “Our competition aims to encourage working Australian journalists to investigate the important roles that agricultural research, training and rural development play in global food security,” said Professor Kaye Basford, Board member of the Crawford Fund and Board Member, International Rice Research Institute. “The journalism award provides an opportunity to acknowledge reporting that highlights the myriad of issues related to food security and agriculture for development, as well as the mutual benefit of related R&D,” she said. “We are delighted to team up again with the Australian Council of Agricultural Journalists to deliver this award and recognise excellence in reporting on food security,” she said. The winning journalist will be provided with a Crawford Fund ‘seeing is believing’ visit to a developing country to view and report on Australian and international research and training underway with a focus on food security. Entries are open for print, broadcast and internet-based reports by working Australian journalists around food security within the 12 months prior to the closing date of Monday, 1 June 2015. The winner will be announced at the Fund’s Annual Conference from 10-12 August in Canberra.